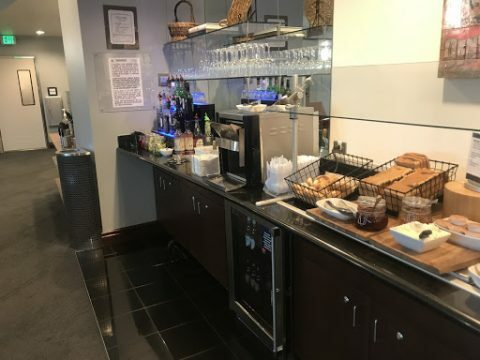 After a long weekend spent hiking and camping in Estes Park, Colorado, I decided to check out the Delta Sky Club at Denver International Airport located in Terminal A. I got to the airport fairly early so had plenty of time to try out a number of food options and other lounge amenities. 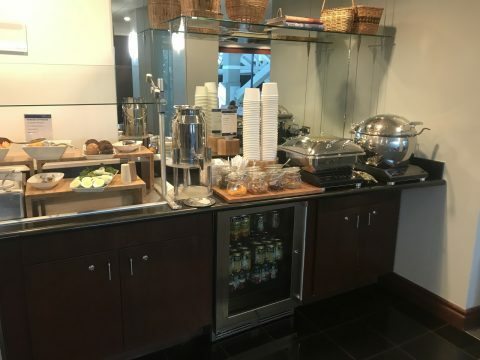 I rated my lounge experience on five factors: The quality and variety of food and drink, club amenities and services, seating, overall convenience and atmosphere. Overall, I’d give this lounge a B. Despite decent food and drink options, the lounge’s lackluster view and limited amenities brought the overall score down. Please share your feedback or thoughts on this review in the comments section below, in our community forum or shoot me an email. I accessed the lounge through The Platinum Card® from American Express, which has quickly become one of my favorite card benefits. Despite the card’s steep $550 annual fee, I’d estimate each visit saves me $10-$40, depending on how many glasses of wine I decide to consume. The Platinum Card® from American Express also features other benefits that justify the cost, including a $200 airline incidental credit (which can be used to purchase flights) and 5X points on some travel. Cardholders of the Gold Delta SkyMiles® Credit Card from American Express or the Platinum Delta SkyMiles® Credit Card from American Express and those with Diamond Medallion elite status can access the lounge, as well as those traveling in first or business class on Delta flights. Delta Reserve and Centurion Lounge cardholders also receive complimentary access only when traveling on Delta-operated flights. The lounge featured options for those in search of a full breakfast or something on-the-go. There were eggs, toast, bagels, muffins and plenty of spreads. 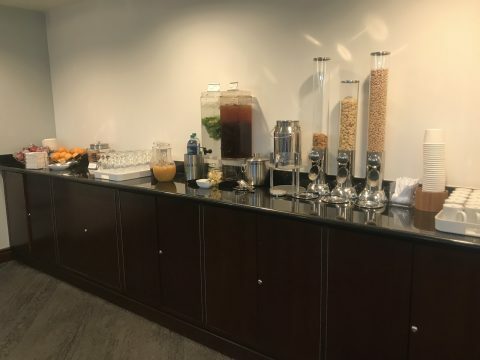 The lounge also featured healthier options too, like oatmeal, yogurt, fruits and vegetables. The food was good but nothing exciting nor particularly notable. There was a self-serve bar plus coffee, iced team, water, plus orange, apple and cranberry juice. Despite being smaller in size, the lounge was well kept and the staff was friendly. Like all lounges, there was fast and reliable Wi-Fi, plenty of charging stations and a few TVs scattered throughout the area. The lounge also featured a small business center and a couple of daily newspapers. The bathroom wasn’t attached to the lounge, a minor inconvenience; but clean and accessible nonetheless. I was there for about three hours and had the place almost all to myself. There were a few rushes but, overall, plenty of capacity. There were reading chairs and options for those looking to work, plus plenty of group seating. Many of the chairs were oversized and comfortable. The lounge wasn’t super easy to find. It takes about five minutes to access so if you’re hoping to swing by on the way to your gate or only have a few minutes, I might suggest skipping the lounge or factoring this into airport arrival times. The Denver airport is big so it took me another 10-15 minutes to get to my gate after leaving the lounge. The lounge is open daily starting at 5 a.m. until 7:30 p.m. 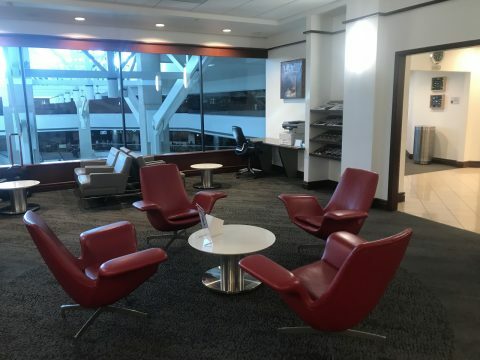 Unlike San Francisco’s newly-renovated Delta Sky Club, this lounge could use a facelift. It doesn’t have a modern or sleek feel but gets the job done. The lounge is dim and lackluster since it doesn’t get any direct sunlight. 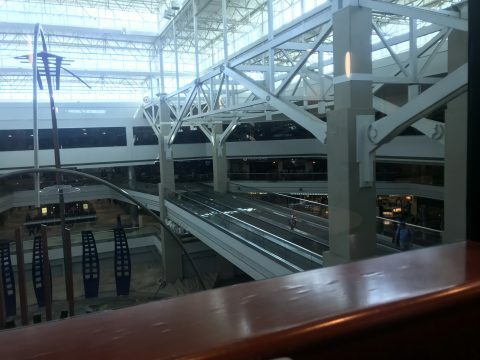 Overall, Denver’s Delta Sky Club lounge was good but not excellent. It does, however, definitely beat spending $15 on crummy food and wandering the cramped terminal before a flight. 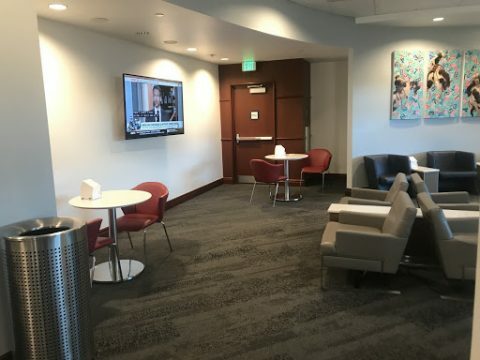 Have you been to the Delta Sky Club at DIA? Leave your thoughts in the comments. We’d love to hear from you. So you’ve got airport lounge access? Are you sure? All information about the Platinum Delta SkyMiles® Credit Card from American Express and the Delta Reserve® Credit Card from American Express has been collected independently by NerdWallet. These cards are no longer available through NerdWallet.